Latest addition to any 'Hounds of Hell' or Addams Family theme party decorations! 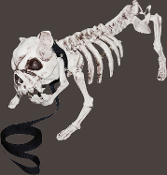 Plastic molded skeleton of a bulldog set on all fours and all ready for a ghostly walk! Complete with a fabric leash and metal studded fabric collar. Creepy static prop building decoration for haunted house scene or maybe the perfect easy maintenance pet for a frequent traveler. The new pet in the family crypt, BONES the ZOMBIE SKELETON PIT BULL DOG Puppy would love to come home with you. A basic dog to create that special scene or make into whatever you invision. He is sure to scare the pants off your neighbors. Over eight inch tall and 16-inch long, made of high quality, durable molded plastic. No need to throw this undead dog a bone, HE IS ONE! Creepy yet loveable... roll on the floor and play fetch with him! (Tee hee... not really!) He's dead, so his bony body just doesn't have flesh. This four legged creepy canine undead dog creates that special scene or can be added to whatever you envision. He is sure to scare the pants off your neighbors! Non-poseable body with jointed jaw that can be moved slightly for adding his latest meal. Approx 16.5-inch (41.25cm) long to end of tailbone x 7-inches (17.5cm) wide across x 8.5-inch (21.25cm) tall to top of head.